Franklin region never fails to produce a raft of talented and fascinating people and in an area renowned for its horticulture, it seems appropriate that HELEN PERRY should unearth an artist whose floral compositions must surely rival that in any local garden. I sit down to talk art with Maukau water colourist, Claudia Slaney. Somewhere along the line we are talking food but I guess there’s a goodly element of artistic creativity in food so we agree it’s okay to digress. However, it isn’t long before we are back on track and Claudia’s personal passion for her work, in particular her most recent exploration of fl oral themes, has me equally enthused. So much so, that then and there, I buy one of her paintings on display at the New Zealand Steel Gallery in Pukekohe. I love Freesias in Spring Rain, it is beautiful and delicate yet incorporates bold, vibrant fuchsia shades with softer mauve tones – my kind of mood colours. But now I digress. Let’s learn more about Claudia Slaney, an artist whose work has sold to clients as far away as the UK and whose talent for teaching recently saw her whisked off to New Caledonia for six days by an artist keen to learn more about painting with water colours. “That was amazing. I first met this lady two years ago when she travelled here for a private art session with me. On leaving she said something like, “I’ll see you again”. I thought that unlikely but you could have knocked me over when this year she emailed and asked if she arranged plane tickets would I visit and stay with her so we could paint together! Although Claudia has always favoured water colours, when she travelled to the UK 11 years ago and spent six years in London, she explored various media. “There were so many first rate workshops, courses and life drawing classes available. I attended as many as I could but eventually it came down to me loving water colours and not wanting to depart from this medium – the colours are so alive and the stunning effects produced by the interactions of the different pigments with water, paper and each other are impossible to resist. As a novice artist, Claudia started out on landscapes but her interest shifted especially when she returned to New Zealand from the UK and settled in Mauku with her partner and son. Although her work, at between $500 and $1200, sometimes less, is generally deemed ‘affordable’ by art lovers, Claudia says it’s not easy to make a living as an artist. Therefore, she also teaches and runs workshops across Auckland, including at the Franklin Arts Centre (at the NZ Steel Gallery) in Pukekohe every Tuesday. 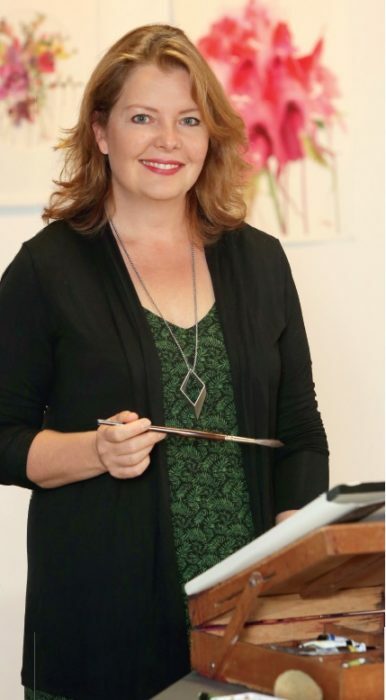 Four of her own works also featured in the recent Flora exhibition in Pukekohe during which she conducted a free session in still life drawing. “While you can never predict how sales will go I’ve been lucky. I do receive orders from overseas and I sell a lot through my website and Facebook page as well as at exhibitions. Really, it’s amazing how many people come out of the woodwork to support you and purchase works. how lucky this lovely lady is – she has talent, yet remains humble about her work and so willing to share her knowledge…including about restaurants! I sense a common bond perhaps there’ll be a chance to explore the art of dining together. Who knows what inspiration will be found.